Coggings and Co is a stunning new restaurant in the recently improved Seven Dials area of Brighton. It has been in owner Andrew’s very capable hands for the last year and he has done wonders with the place. 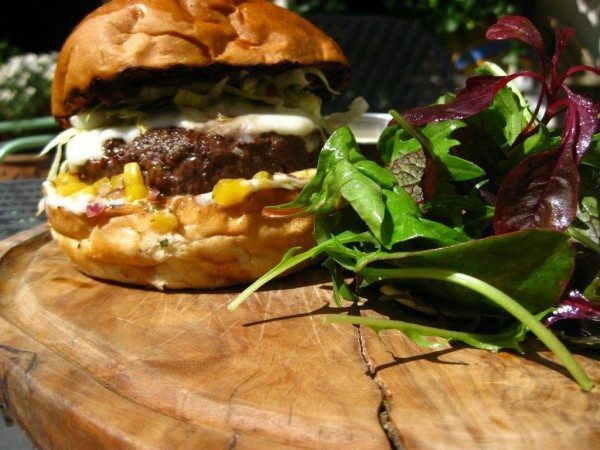 Within the first few months of opening, Coggings and Co had already been named as the best burger restaurant in Brighton & Hove by The Brighton & Hove Independent newspaper. They have also been rated as a “Three Star Sustainability Champion” by the highly respected Sustainable Restaurant Association. 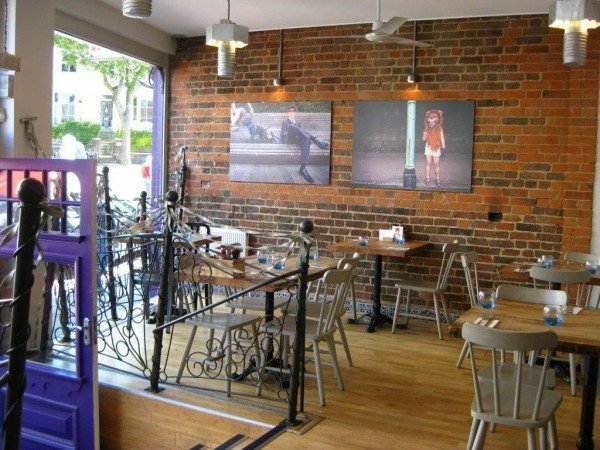 The restaurant has been lovingly refurbished and beautifully decorated throughout. It is modern and clean, with gorgeous wooden floors and furniture and striking bare brick walls. The full height front windows flood the restaurant with natural light making it feel exceptionally bright and breezy. 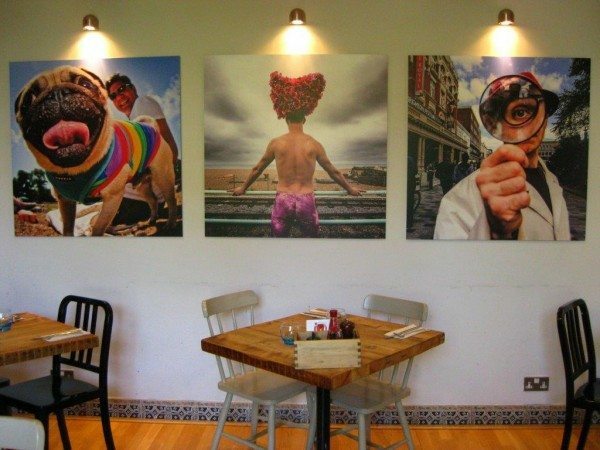 The restaurant also has something of the feel of an art gallery about it, showcasing as it does the fabulous, colourful pictures of brilliant local photographer Heather Buckley. There is not a “West Pier at Sunset” in sight, instead there are several vibrant, fun images that deftly encapsulate the buzzing Brighton vibe in all it’s mad and varied glory. 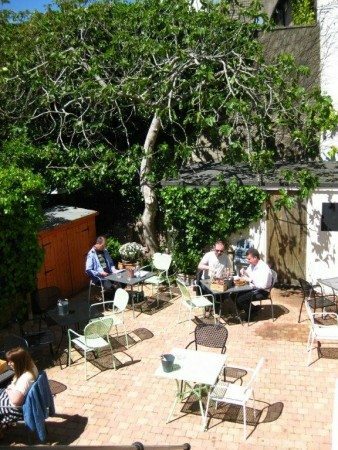 If the weather is right you can enjoy alfresco dining in the lovely courtyard out the back. It is a real sun trap in the afternoon, though if you prefer you can sit in the pleasantly shady South West corner or beneath the branches of the picturesque fig tree. 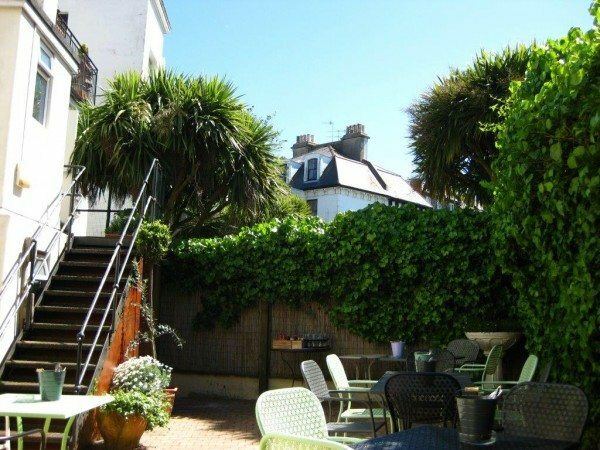 You are completely protected from the sound of traffic and there is a lovely view over the rooftops of Brighton, which is framed by lush, well-tended greenery. The day we went, the weather was glorious and the courtyard felt positively Mediterranean. 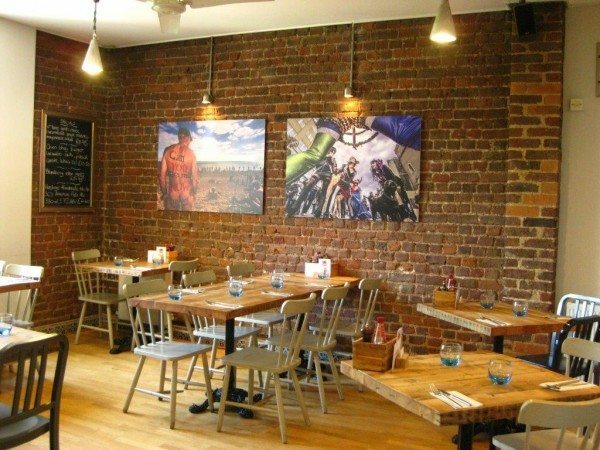 Their menu focusses on burgers made from beef that is freshly ground each day and sourced from the ever-popular, Sussex-based Redlands Farm. However, they do offer a delicious sounding vegetarian burger on their regular menu and the day we visited there was a second veggie option on the specials board too. 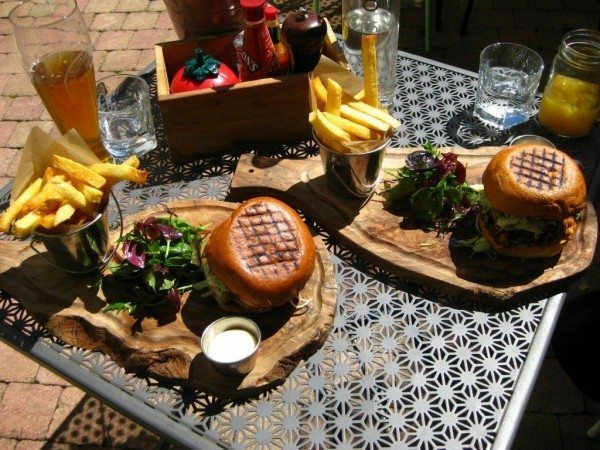 Their burgers come with triple-cooked chips which you can ask to be cooked in either beef dripping or organic vegetable oil. They also offer gluten-free buns and they have a dedicated kid’s menu. If you can’t face moving more than a few feet from your sofa you can now get a Coggings and Co burger delivered direct to your door via the Deliveroo service. The bar has a fantastic selection of local beers and ciders and a comprehensive wine selection including several from renowned Sussex-based wineries. Their coffee is a locally roasted fairtrade, organic, Sumatran variety and their teas come from The Kent & Sussex Tea & Coffee Co.
My friend Rik and I installed ourselves in the courtyard and basked in the sunshine whilst we decided what to order. Given the glorious weather, cold drinks were definitely in order. Rik settled on a very sensible orange juice but I couldn’t resist a pint of the fantastic Firebird Bohemia Pilsner, which was just the ticket for a hot, sunny afternoon. 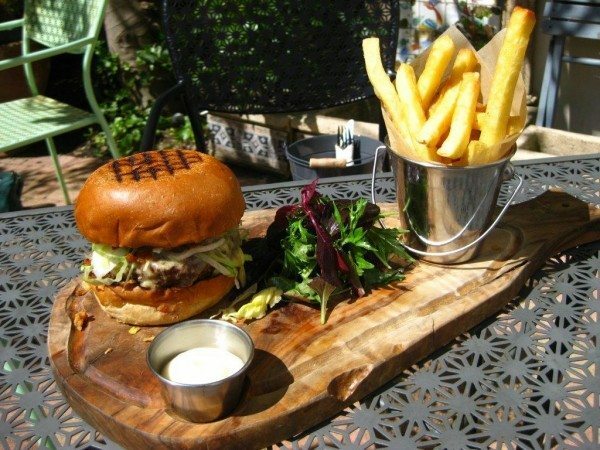 After studying the mouth-watering menu, Rik settled on the Brighton blue cheese and bacon burger, which consisted of a 6oz Beef burger, Brighton blue cheese, slow roast tomato and bacon jam, crispy onions and salad. 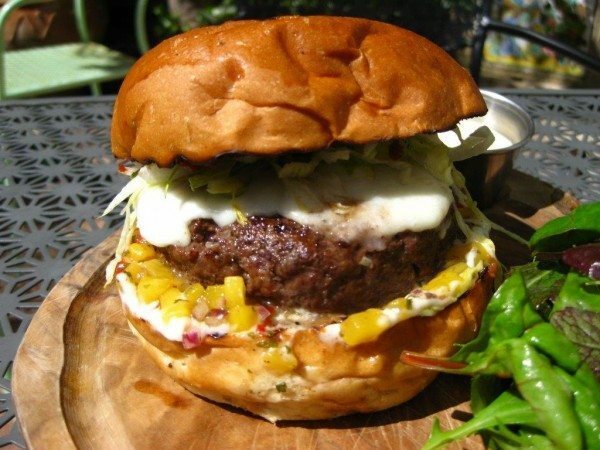 I opted for the chilli burger with scotch bonnet chilli sauce, mango salsa, provolone cheese, mayonnaise and salad. While we were waiting we were ruthlessly teased by delicious smells wafting out from the kitchen. Fortunately we didn’t have to wait long and when the food arrived it looked amazing! I took my pictures as quickly as possible so we could tuck in, and OMG, it was lush! So much so that after our initial yummy noises and satisfied lip-smacking, we ate in silence for some considerable time. There was, after all, important work to be done! The burgers themselves were spectacular! They were thick, succulent and perfectly cooked, browned on the outside and beautifully pink in the middle. The salad was fresh and crunchy and it was all served in a proper bread roll (not one of these trendy sweet brioche affairs that, in my opinion, can come as a bit of a shock to the taste buds when you are expecting something savoury). They also, as my mate Rik the engineer pointed out, held together very well while we were eating them, despite the contents being moist and juicy. The burgers were accompanied by excellent chips which were golden and crunchy on the outside and light and fluffy in the middle, with not a hint of greasiness. I normally drown chips in vinegar but in this case it would have been a travesty as they tasted fantastic all on their own. There was a scrummy mayonnaise for chip-dipping and a delicate little salad of mixed leaves. You might expect the salad just to be token greenery but, on the contrary, even this was good, fresh and crisp and coated in a lovely dressing. Rik’s burger was deliciously cheesy and the intriguing sounding bacon jam was a triumph, giving it an extra salty, bacony kick. As for mine, I was delighted to see a spicy burger on the menu as I like my food lively. The scotch bonnet sauce was fantastic! The warmth built up gradually to a very satisfying fiery heat. The sweet, juicy, tangy mango salsa was the ideal partner to the chilli and it was all topped off with gorgeous provolone cheese. As delicious as each of the component ingredients were, the end result was even greater than the sum of its parts and the overall effect was heavenly! I would go as far as to say that it was the best burger I have ever eaten, a resounding yum! 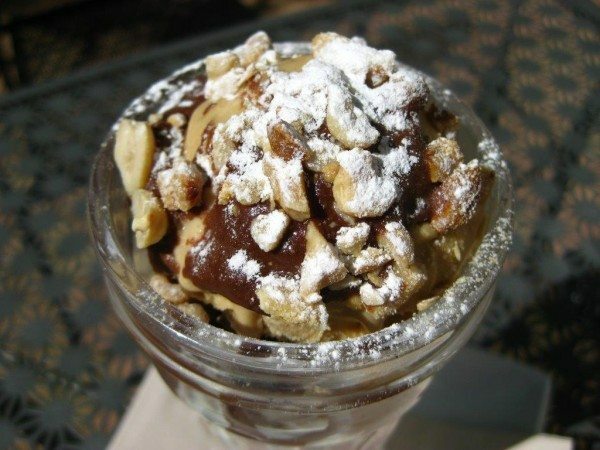 For dessert, Rik had the chocolate peanut butter fudge sundae. It looked and tasted fabulous! It was nutty and fudgy and chocolatey and creamy, just utterly divine. I must confess, I was a little jealous. I had the chocolate torte, raspberry coulis and crème fraiche. My pudding envy was quickly replaced by contented satisfaction. 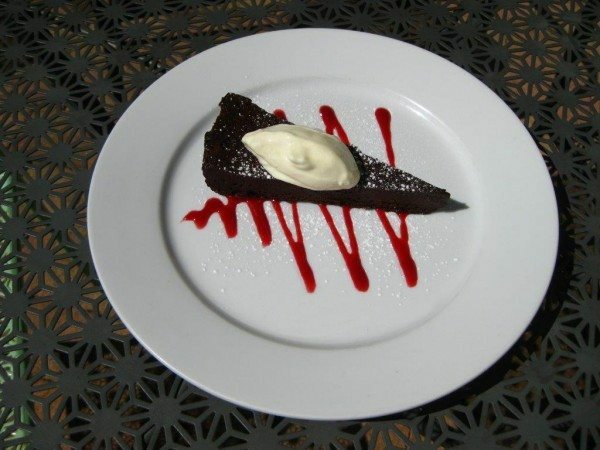 The torte was soft, smooth and intensely chocolatey and not too heavy as such puds can tend to be. 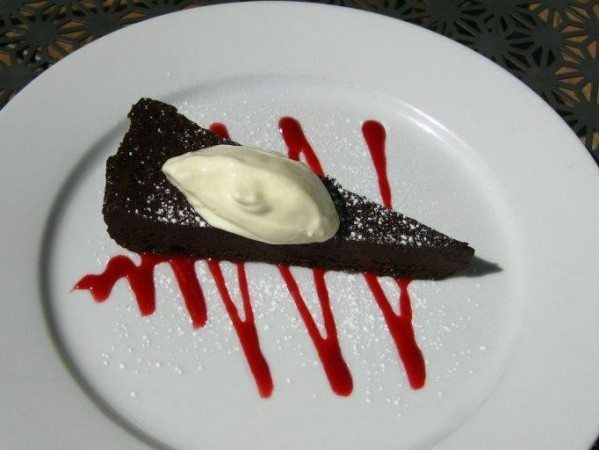 The wickedly fruity coulis and the slight acidity from the cool, light crème fraiche combined well with the richness of the torte and it was quite delightful.